This man’s name is Randolph Westphal and he has one incredible story to tell. The German native has been biking all around the world for more than two decades in an effort to raise awareness and inspire cancer patients. Westphal was diagnosed with malignant melanoma in 1987. At the time of diagnosis, the cancer had already spread to his lymph nodes and he was given a fairly grim prognosis– 6 to 12 months. He decided then and there that he was going to make a serious change in his life. He hopped on his bike and has been riding ever since. Westphal is now 55 years old and has ridden his bike for more than 130,000 miles all across the continents of Europe, North America and South America. His faithful travel partners are his two big huskies– Nanook and Chinook. His goal is to help inspire other cancer patients to live their lives to the fullest no matter what. This man’s iron resolve is indeed awe-inspiring. He has completed several world tours on his bike despite undergoing 28 cancer operations over the last 20 years. He’s also dealt with some rough weather and several dangerous encounters on the road. Though as he puts it, none are more dangerous than humans. He was partially run over by a truck in Argentina in 1996. The driver left Westphal crumpled in a ditch on the side of the road where he was found 4 hours later. His leg was in critical condition and he had suffered massive head trauma. It took years for him to fully recover but his resolve never wavered. His current trip has taken him up through the Eastern United States on course for Canada. The heavy winter weather has slowed Westphal’s progress somewhat, but it hasn’t dismayed this stoic cancer survivor. He hopes that he’ll be able to recover some of his lost memories by spending time with the people that he stayed with last time he rode through these states. “And now I’m back to find what was here, what I have done here, who knows me,” he said. Westphal relies on donations to continue his global biking for cancer awareness. Residents of the towns he rides through are usually more than happy to offer him some food and a warm place to stay for the night. 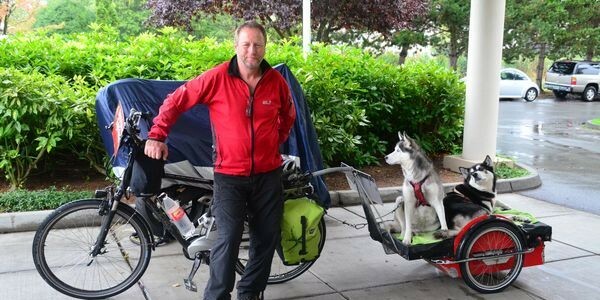 He plans to continue his ride north towards Canada despite the cold weather. His message for those who are battling any form of cancer is to continue fighting and be willing to really live your life.